Anatoli Ivanishin, Takuya Onishi and Kate Rubins enjoyed a flawless homecoming Saturday night, starting with their departure from the orbiting outpost at 0:35 UTC to mark the start of a two-orbit free flight aboard their Soyuz MS-01 spacecraft ahead of a rocket-powered braking maneuver and blazing re-entry into the atmosphere. Deploying its huge orange-and-white main chute, Soyuz punched through a broken cloud deck above its remote landing site and fired rockets to cushion its contact with Terra Firma at 3:58 UTC, marking the completion of a four-month mission. Being helped out of their Soyuz by ground crews who rushed to the landing site, all three crew members appeared to be in good health, looking back at a rather fast-paced summer spent aboard the Space Station. 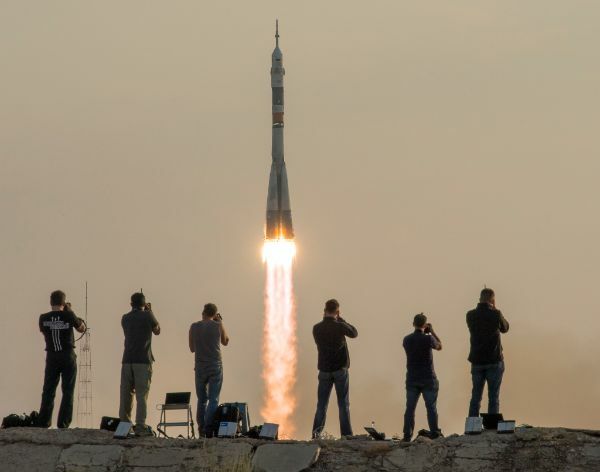 They lifted off from the Baikonur Cosmodrome on July 7th following a multi-week delay due to a teething issue in the flight software of the new Soyuz MS spacecraft series. Finally in orbit, the crew took the new Soyuz model for a two day test drive ahead of a textbook docking to become part of ISS Expedition 48. Over the course of their mission, the crew supported busy cargo traffic with a Progress arrival and departure, and cargo deliveries by the SpaceX Dragon and most recently the Cygnus OA-5 operated by Orbital ATK. A pair of spacewalks conducted in August by Kate Rubins and ISS Commander Jeff Williams saw the successful installation of the first International Docking Adapter to serve as docking port for upcoming Commercial Crew flights. 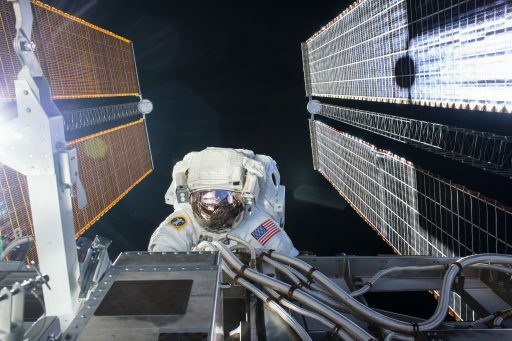 The spacewalkers also retracted a thermal radiation and gave ISS some badly needed HD vision by installing a pair of high-resolution still and video cameras for external inspections and Earth Observation. But the major focus of the crew’s stay in orbit was science, supporting close to 200 active experiments ongoing in the various laboratory modules of the Space Station and covering virtually all scientific branches. One highlight for Kate Rubins was the first DNA Sequencing carried out in space that demonstrated this extremely valuable tool for future studies on ISS that will no longer require samples to be flown back to Earth. 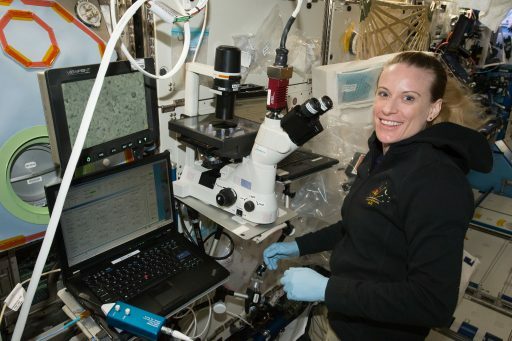 The ability of sequencing the DNA of living organisms in space is of extreme value to the scientific community and also opens up a number of medical possibilities to track crew health status during prolonged exposure to the space environment. The Soyuz MS-01 crew had ISS to themselves for six weeks starting with the departure of Williams and Russian Cosmonauts Ovchinin and Skripochka in early September. Their departure and safe landing was to be followed by the launch of Soyuz MS-02 craft two weeks later, but a wiring problem in the Entry Capsule caused a four-week slip and in turn created only a nine-day handover of Expedition 49 to 50 after the October 21 arrival of Sergei Ryzhikov, Andrei Borisenko and Shane Kimbrough. The departing crew quickly handed their experiments over to the new crew and walked them through the intricacies of some of the Station’s hardware that may not be covered in ground training – an important aspect of the direct handover of crews. The crew’s last week on ISS was particularly busy – welcoming the Cygnus cargo craft last Sunday and opening it for business later the same day followed by a series of experiments tasking the crew with planting lettuce for a plant cultivation study and isolating themselves in the airlock at reduced pressure to complete an examination for the Airway Monitoring Experiment. 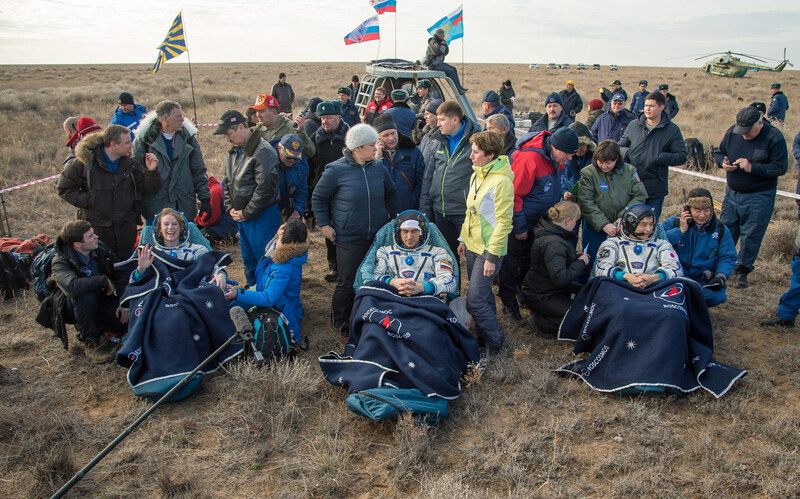 On Saturday, the crew was able to sleep in before powering up the Soyuz and saying their good-byes to the Expedition 49/50 crew members who will remain in orbit until late February. Soyuz was sealed off by closing hatches on the spacecraft and the Rassvet – marking the start of a two-hour process for the crew to check for leaks, configure their Soyuz for undocking and put on the Sokol Launch and Entry Suits – their last line of protection in case of a depressurization on the way down. Commander and veteran space flier Anatoli Ivanishin, flanked by Takuya Onishi on the left and Kate Rubins on the right, sealed themselves off inside the confined Entry Module of the Soyuz and switched the spacecraft to internal power before sending a series of commands to initiate the decoupling of the Soyuz after a 113-day stay at ISS. 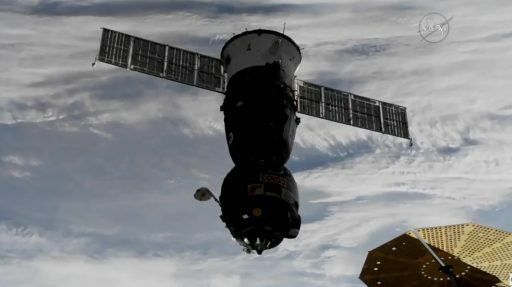 Soyuz began driving open its hooks and loaded springs pushed the seven-metric-ton spacecraft away from ISS at 0:35 UTC, marking the start of a brief free flight. 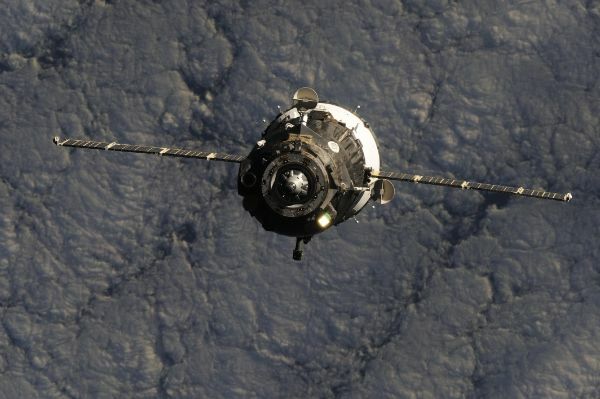 Drifting away passively for three minutes, Soyuz fired up its DPO thrusters at a distance of 20 meters for a short burst of eight seconds to increase its opening rate along the R-Bar, the radial vector connecting ISS with the center of the Earth. Anatoli Ivanishin then got to enjoy some manual flying – studying the response of the motion control system to inputs on the Rotational and Translational Hand Controllers to verify Soyuz is easily controllable with the new MS thruster layout. Upgrading from the TMA to the MS Series, Soyuz now features an upgraded thruster arrangement with 28 130N DPO thrusters installed in pairs, creating a more robust system by eliminating lower-thrust engines in use on the previous Soyuz generation. After the test, nine minutes and 20 seconds after undocking, Ivanishin made a manual separation maneuver, placing Soyuz on the usual V-Bar departure path along the velocity vector to open a sufficient gap ahead of the deorbit burn. 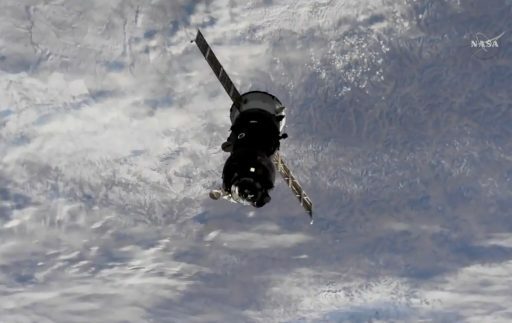 The newly installed HD cameras on ISS delivered spectacular footage of the Soyuz departure, the manual flying exercise and tracked the spacecraft for over half an hour as it drifted away from the orbiting outpost. In preparation for its rocket-powered braking maneuver, Soyuz spun to a tail-first orientation with the main engine facing the direction of travel. Ignition of the SKD main propulsion system was confirmed right on time at 03:06:34 UTC to begin the process of slowing the Soyuz down in order to drop out of orbit en-route to the landing site in South Central Kazakhstan. The 300 Kilogram-force main engine fired for four minutes and 37 seconds, in the process slowing the Soyuz by 127.98 meters per second and putting it on a sub-orbital arc intersecting Earth’s atmosphere. 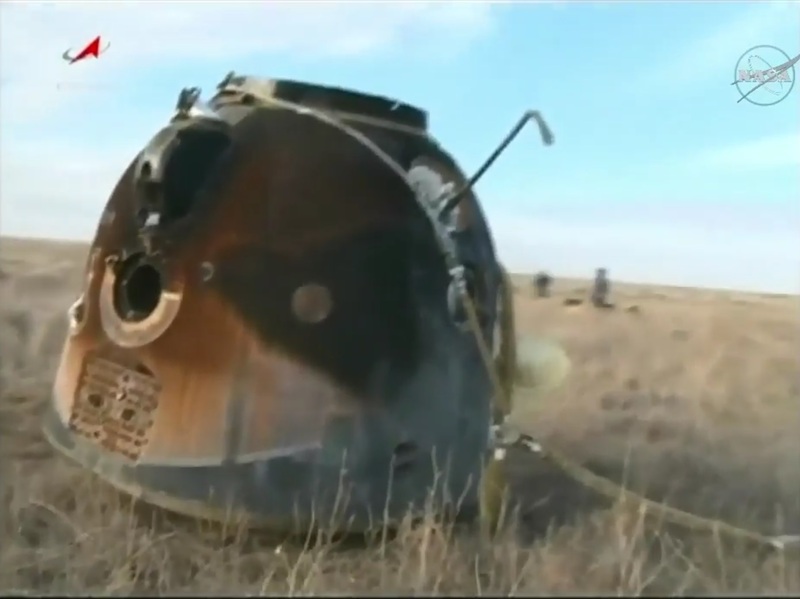 Falling towards the atmosphere, Soyuz again accelerated to a speed of 7.6 Kilometers while, onboard the small Entry Module, the three crew members closed their helmets to be ready for the planned depressurization of the Orbital Module. Soyuz emerged from orbital night just as it crossed over the equator, delivering to the crew their last of over 1,800 sunrises during their four-month mission. A series of bangs shook the Soyuz at 03:33 UTC when pyrotechnics were fired to split the spacecraft in three – the disposable Orbital and Service Modules were pushed away to head toward a fiery, destructive re-entry while the 2.2 by 2.17-meter Entry Module powered up its Hydrogen Peroxide thrusters to face its heat shield to the direction of travel. Module Separation occurred over the Red Sea at an altitude of 140 Kilometers with Soyuz continuing to speed toward the onset of Re-Entry over Northern Iraq. Soyuz hit the discernible atmosphere at precisely 03:36:26 UTC when passing 100 Kilometers in altitude – beginning the process of slowing down from 25 times the speed of sound to zero in a period of only 23 minutes. Immersed in bright plasma, Soyuz relied on its ablative heat shield designed to slowly burn away and create a gaseous boundary layer between the extremely hot shockwave layer of compressed air in front of the spacecraft. The heat shield had to endure temperatures up to 1,600°C and the windows began glowing bright yellow while the three crew members were completely on their own due to a four-minute plasma blackout. 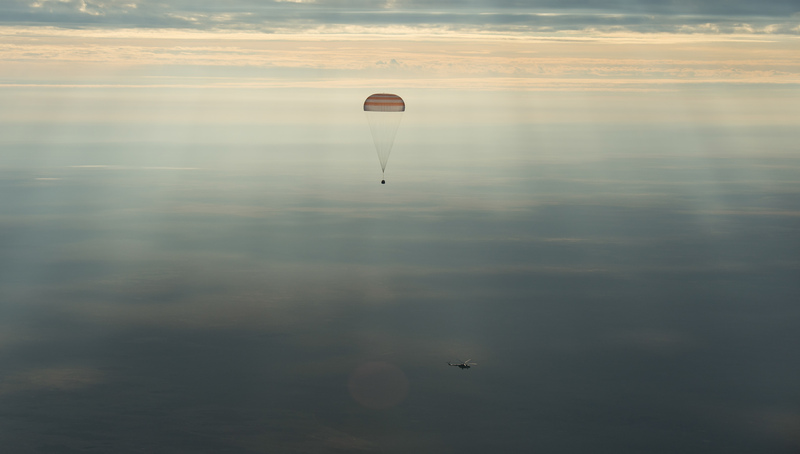 Emerging from the plasma, Soyuz and its crew pulled a maximum of 3.5 Gs and the spacecraft actively modified its trajectory to eliminate cross track errors and control the downrange travel distance to arrive at a pre-determined parachute opening position. 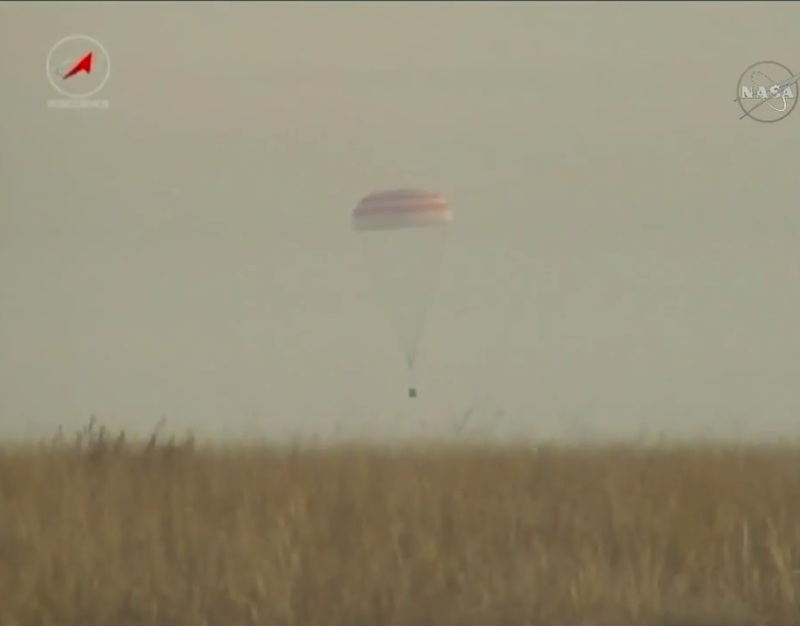 At 10.8 Kilometers, Soyuz jettisoned its parachute cover and ejected a pair of small Pilot Chutes that inflated and pulled the larger Drogue Chute from its bag. Deployment of the chutes at a speed of Mach 0.7 creates one of the wildest moments of the descent, aside from landing itself, with Soyuz gyrating rapidly under the chute for about half a minute before the flight stabilizes. The descending capsule slowed to 80 meters per second under the Drogue and, at 7.5 Kilometers in altitude, deployed its huge orange-and-white main chute to further slow down and transition to a vertical descent. 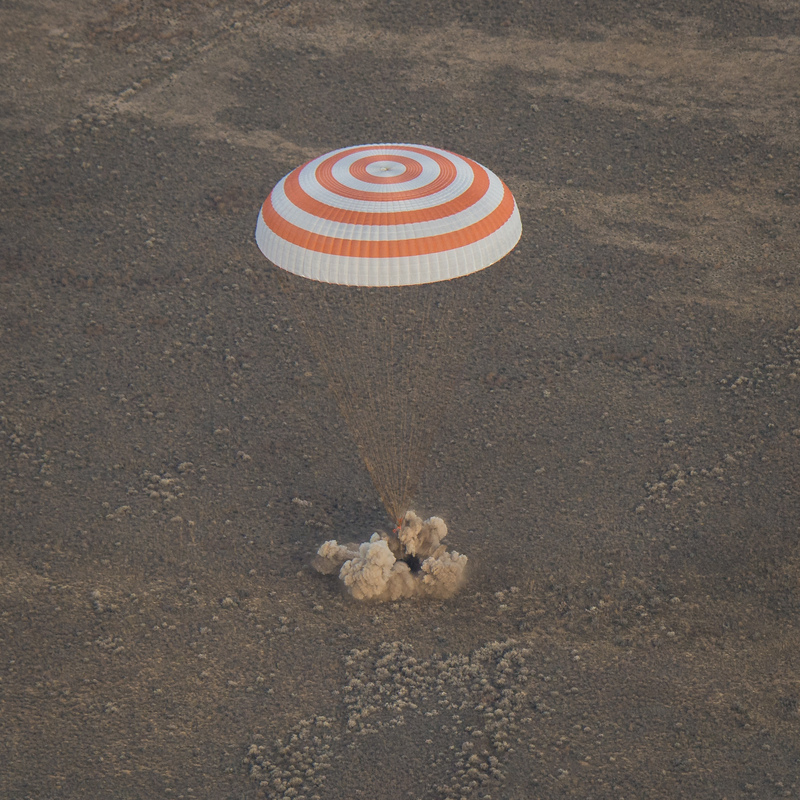 Kicking off a fast-paced landing program, Soyuz dropped its heat shield to expose the landing engines and altimeter for the collection of precise altitude information. The Hydrogen Peroxide tanks were vented to avoid any hazards after landing, the blackened window covers ejected to give the crew a clear view outside, the pressure of the capsule was equalized and the crew seats were lifted up for shock-absorbing purposes upon landing. New for Soyuz MS, a GPS receiver determined the spacecraft’s position that was then transmitted by a Cospas-Sarsat transponder to make locating the vehicle easier in case of an off-target landing. 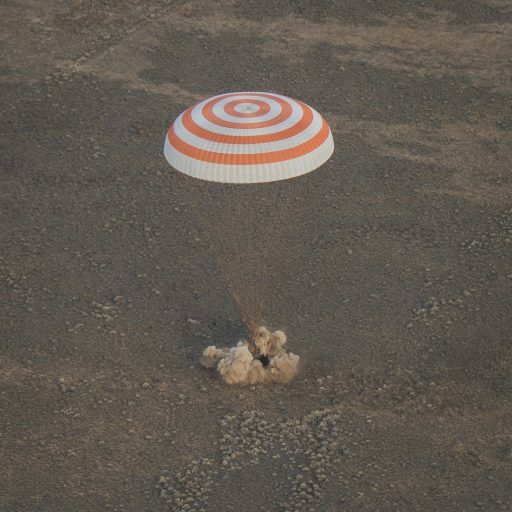 This was not the case on Sunday and Soyuz descended toward a bullseye touchdown in the primary landing zone, 148 Kilometers south east of the town of Dzhezkazgan. Soyuz used its gamma-ray altimeter to judge when touchdown was imminent to blast the solid-fueled Soft Landing Engines in order to cushion its impact. 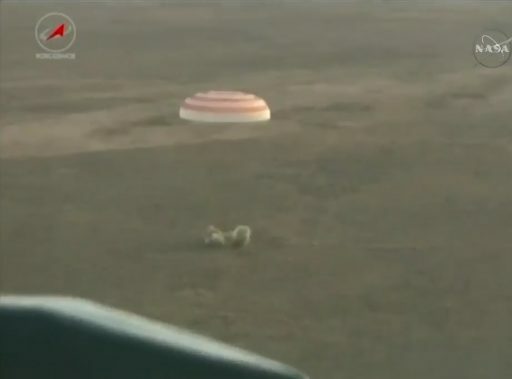 Landing occurred at 3:58 UTC, 9:58 a.m. local time in the Kazakh steppe to cap a flight of 115 days, 2 hours and 22 minutes. Meeting Terra Firma, by some likened to a small car crash, Soyuz came to rest in an upright posture and the crew remained in their seats while recovery forces in ground-based vehicles and helicopters descended on the landing site. The experienced recovery team was extremely quick in getting to the Soyuz, rigging up a stand for crew extraction and opening up its hatch to begin getting the crew out of the small capsule. The three crew members were one-by-one helped out of the Soyuz and seated in reclining chairs to catch their breath for a few minutes and making the traditional calls to their families via satellite phone. 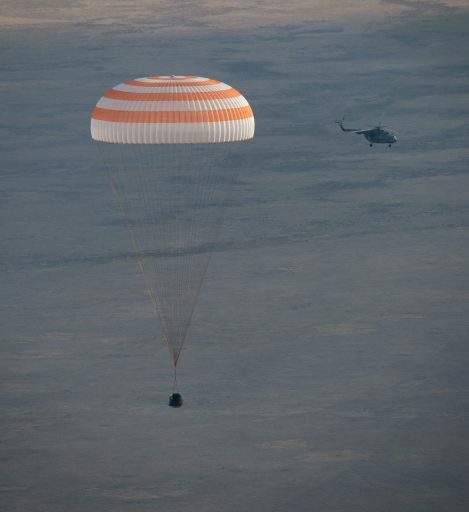 All three appeared to be in very good condition and were seemingly eager to tell the recovery crew about their turbulent ride back to Earth. Anatoli Ivanishin, the most experienced of the trio, has now logged 280 days in space on two ISS missions as part of Expedition 29/30 in 2010/11 and Expedition 48/49 in 2016. Kate Rubins and Takuya Onishi now both stand at a career total of 115 days in space, returning from their first long-duration stint on ISS. 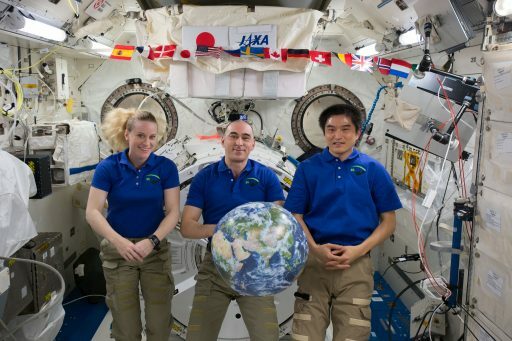 The three crew members will participate in a traditional welcoming ceremony in Karaganda before they part ways as Ivanishin heads back to Star City near Moscow and Ruins & Onishi board a NASA plane back to Houston for several weeks of post-flight operations including physical therapy and plenty of experiment sessions to study how their bodies responded to returning to gravity after an extended stay off the planet. For ISS Expedition 50, the three-crew operations phase is hoped to be much shorter than for the two previous increments as Soyuz MS-03 is already in the final phase of processing, aiming for a November 18 liftoff from Baikonur with Commander Oleg Novitskiy and Flight Engineers Thomas Pesquet of ESA and Peggy Whitson of NASA for a half-year flight to ISS. 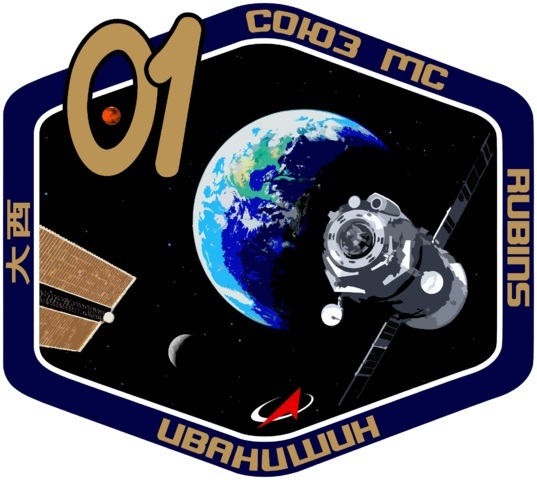 Copyright © 2019 Soyuz MS-01 | Spaceflight101. All rights reserved.